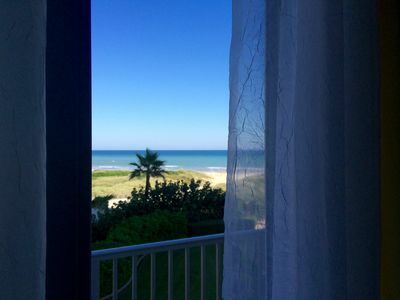 Breathtaking Panoramic Ocean Views from Private Balcony, Great Romantic Getaway!! Enjoy a piece of paradise at Aquarius Condominium Community, Unit 302, your home away from home. 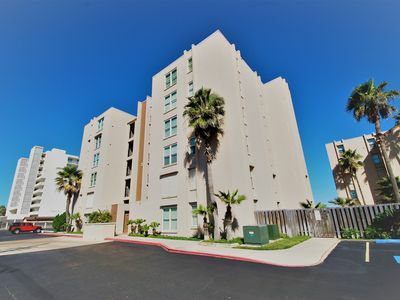 This gorgeous condo is the perfect place for a romantic getaway for two as you create unforgettable memories while experiencing South Padre Island. 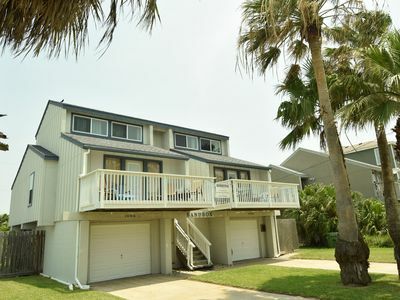 Has a connecting door to unit 303, a great option for multiple couples or families to vacation together and have private rooms in the evening. 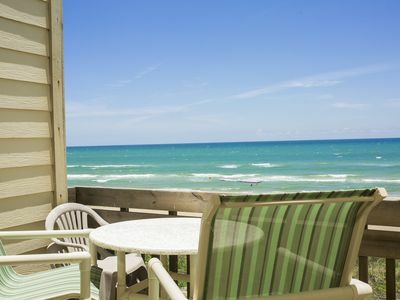 Begin your day eating breakfast on the furnished oceanfront covered balcony while you take in the breathtaking panoramic views of the Gulf of Mexico. In the afternoon quench your thirst with a refreshing beverage while you sit back and enjoy the salty sea breeze while listening to the soothing ocean waves. When the sun goes down, watch the shrimp boat lights dance across the water. Natural light brightens the living, dining and kitchen areas of this condo through large floor to ceiling windows. 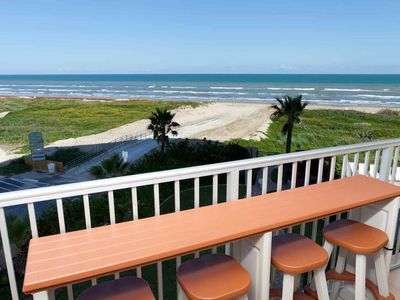 Continue to enjoy the views of the ocean while preparing a beach snack or while relaxing on the lounge chair or comfortable couch. 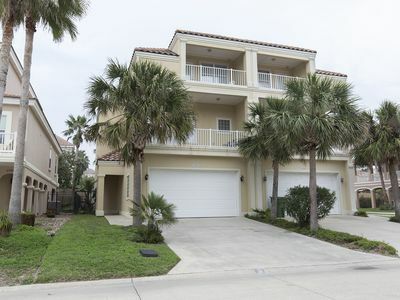 Open the sliding glass doors leading out to the balconies to let in the salty sea breeze to enjoy indoors. Put your feet up in the evening, while watching a movie on the flat screen TV. Enjoy the crisp white cabinets and striking black countertops, as you whip up scrumptious meals in the fully stocked kitchen. 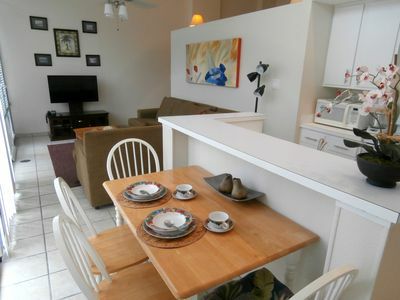 Dining table seats 4 guests comfortably, additional seats at breakfast bar. 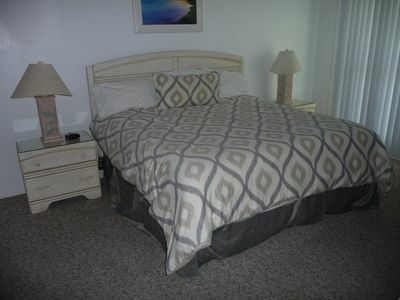 The gorgeous cozy master bedroom, decorated in beach motifs has an oversized queen bed to ensure a restful night of sleep. 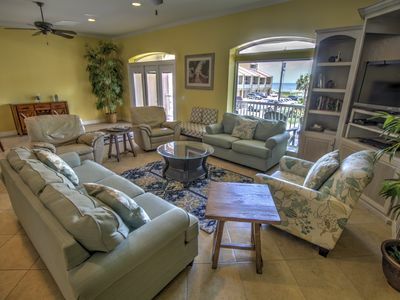 Access the second balcony through the sliding glass door, the perfect spot to sit back and devour a good book. 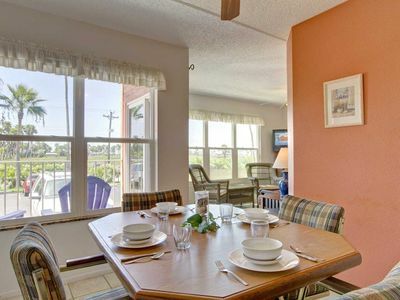 Watch a show on the flat screen TV as you unwind from a fun filled day. Freshen up in the lovely spacious bathroom, has storage for toiletries below vanity and in the cabinet above the toilet. 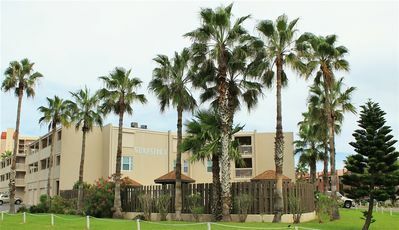 Has a beautifully tiled walk-in shower with sliding glass doors. Great for taking a hot shower to relax your tired muscles at the end of the day. 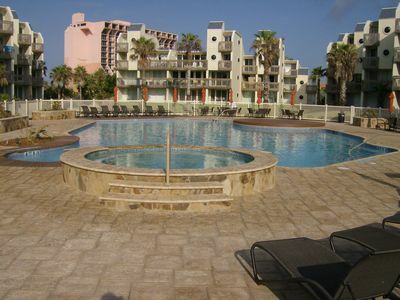 Aquarius Condominium Community offers a variety of features to enhance your tropical getaway. On the first floor, you will find a game/exercise room with a large ping-pong table, exercise equipment and views of the breathtaking ocean. 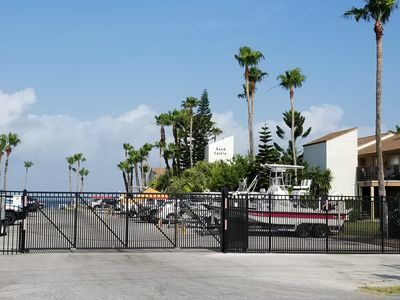 Step outside in the spacious courtyard adorned with palm trees to enhance your tropical escape. The huge beachfront sparkling pool sits front and center surrounded by lounge chairs. 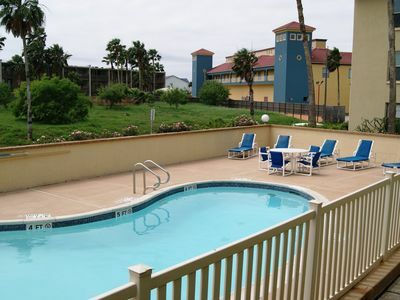 Multiple pool-side picnic areas with BBQ grills are scattered around the courtyard. 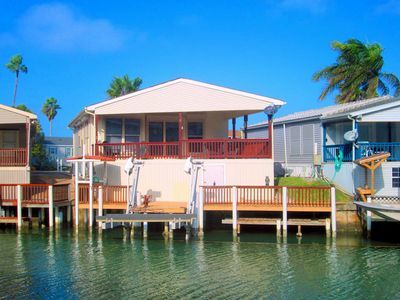 Enjoy direct ocean access to the sandy beach and crystal-clear ocean. In the evening unwind in the hot tub as you gaze at the spectacular starry sky. 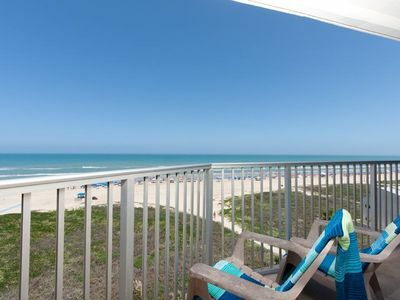 Aquarius 504 - Beautiful Beachfront Condo, Spectacular Ocean Views, Perfect Getaway for Two! 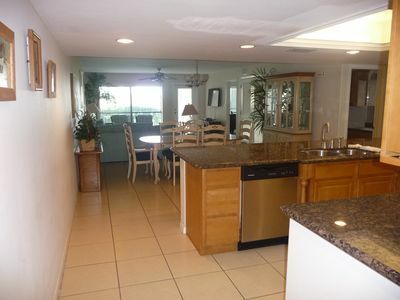 Newly renovated 2 bedroom 2 bath Beachfront Condominium. 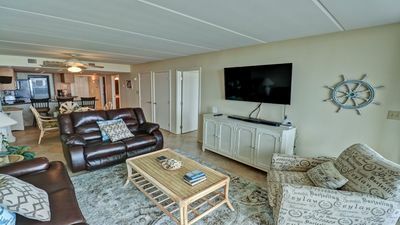 Bright waterfront condo w/ shared pool, hot tub, and a private boat slip! 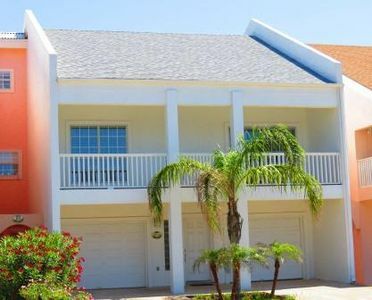 Divine Beachfront Home for your Luxury Vacation! 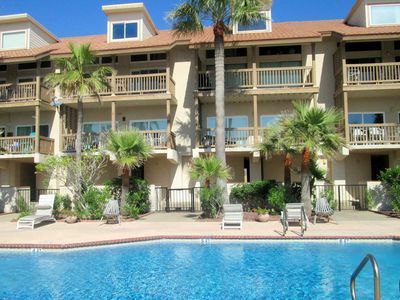 Private Pool & Hot Tub, Private Boardwalk!